Sometimes, however, all-positive reinforcement is just not enough. That's because not all reinforcement comes from us. An inappropriate behavior can be self-reinforcing—just doing it makes the dog feel better in some way, whether you are there to say "good boy!" or not. Some examples are eating garbage, pulling the stuffing out of your sofa, barking at passersby, or urinating on the floor. Although you don't want to personally punish your dog, the occasional deterrent may be called for to help derail these kinds of self-rewarding misbehaviors. In these cases, mild forms of impersonal or remote punishment can be used as part of a correction. The goal isn't to make your dog feel bad or to "know he has done wrong," but to help redirect him to alternate behaviors that are more acceptable to you. • Personally punished dogs are not taught appropriate behaviors. • Personally punished dogs only stop misbehaving when they are caught or interrupted, but they don't learn not to misbehave when they are alone. • Personally punished dogs become shy, fearful, and distrusting. • Personally punished dogs may become defensively aggressive. • Personally punished dogs become suppressed and inhibited. • Personally punished dogs become stressed, triggering stress-reducing behaviors that their owners interpret as acts of spite, triggering even more punishment. • Personally punished dogs have stressed owners. • Personally punished dogs may begin to repeat behaviors they have been taught will result in negative, but predictable, attention. 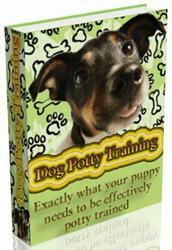 • Personally punished dogs are more likely to be given away than are positively trained dogs. You do this by pairing a slightly startling, totally impersonal sound with an equally impersonal and very mild remote consequence. The impersonal sound might be a single shake of an empty plastic pop bottle with pennies in it, held out of your dog's sight. Or you could use a vocal expression such as "eh!" delivered with you looking away from your misbehaving dog. Pair your chosen sound—the penny bottle or "eh! "—with either a slight tug on his collar or a sneaky spritz on the rump from a water bottle. 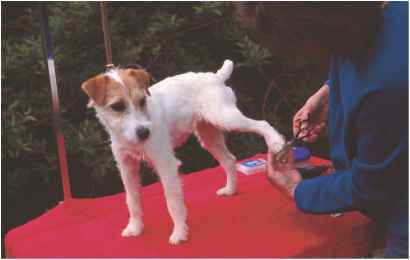 Do this right as he touches something he should not; bad timing will confuse your dog and undermine your training success. To keep things under your control and make sure you get the timing right, it's best to do this as a setup. "Accidentally" drop a shoe on the floor, and then help your dog learn some things are best avoided. As he sniffs the shoe say "eh!" without looking at him and give a slight tug against his collar. This sound will quickly become meaningful as a correction all by itself—sometimes after just one setup—making the tug correction obsolete. The tug lets your dog see that you were right; going for that shoe was a bad idea! Your wise dog will be more likely to heed your warning next time, and probably move closer to you where it's safe. Be a good friend and pick up the nasty shoe. He'll be relieved and you'll look heroic. Later, when he's home alone and encounters a stray shoe, he'll want to give it a wide berth. Your negative marking sound will come in handy in the future, when your dog begins to venture down the wrong behavioral path. The goal is not to announce your disapproval or to threaten your dog. You are not telling him to stop or showing how you feel about his behavior. You are sounding a warning to a friend who's venturing off toward danger—"I wouldn't if I were you!" Suddenly, there is an abrupt, rather startling, noise! Now is the moment to redirect him and help him earn positive reinforcement. That interrupted behavior will become something he wants to avoid in the future, but he won't want to avoid you.